Some time ago, I realized that I needed a complete set of undergarments to wear under an 18th century dress. I did the research, found some accurate-looking patterns, and got busy. The ensemble would consist of a shift, pair of stays, set of pocket hoops, petticoat, neckerchief, and cap. First, let’s look at the shift and stays. 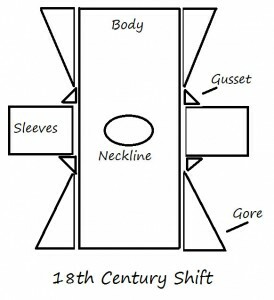 The shift is the first undergarment put on, the equivalent to the Victorian chemise. It’s like an A-line dress, with a low neck and short, straight sleeves. 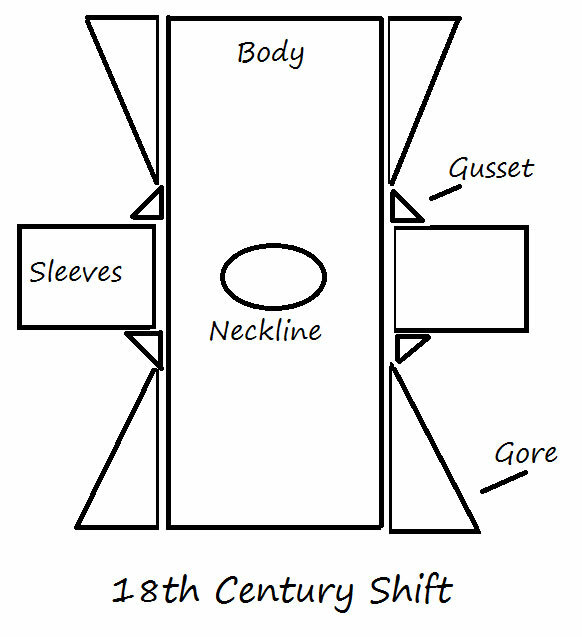 I adapted the pattern given in the book Period Costume for Screen and Stage (1500-1800) by Jean Hunnisett; that is, basically, two rectangles, triangular gores on the sides, a slight scoop for the neck, underarm gussets, and narrow sleeves. Only, I didn’t have fabric enough to cut separate gores, so the body simply widens on the sides toward the hem. 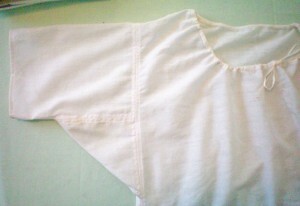 I had in my stash an old flat sheet made of a very thin, sheer, and super soft poly-cotton blend. Ideally, a shift should be made of all cotton or linen, so that it absorbs your body’s oils and perspiration and keeps you cool. This was so soft, however, that I couldn’t resist using it. I’d already cut it out to make a renaissance styled shift with full sleeves, but then noticed a grease stain on one of the sleeves. Since I couldn’t use it for that purpose anymore, I cut it down for the 18th century shift instead. First, I marked the fabric according to the pattern in the book, making modifications as necessary to fit the small amount of fabric I had. I then cut it out and stitched it together using the sewing machine. While hand stitching has its place, I am not quite invested enough to sew an entire garment that way. Perhaps someday. The finished shift has a ribbon drawstring neck and fits loosely. It’s a tad sheer for my taste, but after all, it is mostly hidden by all the other layers. The only problem I have with it is that, for some reason, it feels like I’m wearing it backwards. It isn’t, but it feels that way. Like something’s just a little off. The neck is just a trifle high, perhaps, or the sleeves are set too far back, or something . . . but I haven’t been able to pinpoint it, exactly. The stays are the next garment you put on. They are conical in shape, designed to smooth the torso and uplift the bosom. They also provide a strong foundation for your skirts to hang from. I chose to use Butterick 4254 as my pattern, making the view that laces in front and back. One major modification I made was to cut the shoulder straps off, as these caused a significant backache when I tried them on. I had a pearl-colored taffeta in my stash, which I decided would make a lovely pair of stays. Boning is often a hassle for re-enactors, since it’s impossible to use real whalebone anymore. Some use reed, others use steel, but I chose to use artificial whalebone, aka plastic duct ties, which are a larger, sturdier version of cable ties. Next week, we’ll take a brief look at my pocket hoops and petticoat. Then, we’ll examine my cap and neckerchief. 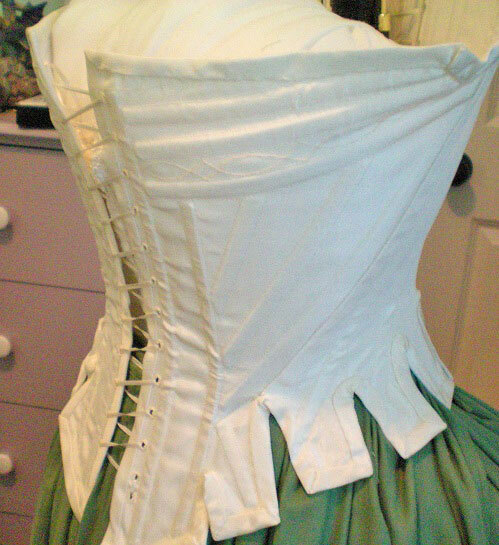 Have you made any undergarments from the 18th century? What challenges did you face? Do you have any idea why my shift feels like it’s on backwards when I wear it? This entry was posted in Wednesday's Projects and tagged 18th Century, Corsets, Wednesday. Bookmark the permalink.